It’s hard to ostracise the popularity of the SUV phenomenon. People are loving the SUV, and the growth in Australia is forecast to continue to climb. Being in a solid, roomy SUV is always an appealing proposition when you have loved ones who are journeying with you. Fully electric SUVs, however, are less prevalent than mainstream petrol and diesel SUV models. But they are out there and are becoming less rare. Jaguar’s I-Pace, Mitsubishi’s Outlander PHEV, Porsche’s Cayenne S E-Hybrid and Volvo’s electric XC40, XC60 and XC90 models are some of the vehicles that are currently on offer and are proving to be successful. Audi are in on the game now, wanting a slice of the electric SUV pie, and it’s in the form of their stylish new Audi e-tron Sportback. It would be hard to describe Audi’s e-tron Sportback as being a ‘melt-in-the-mouth-moment’, however the edgy and bulbous design is rather futuristic and eye-catching. It is definitely unique; not a design that is as refined as ‘say’ the new Volvo XC90 but a style that does capture the power delivered from within, none-the-less. 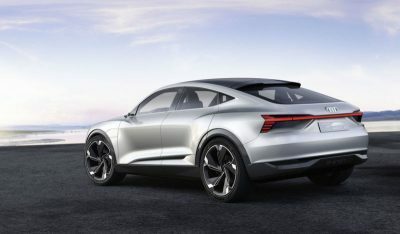 The sexiest part of the e-tron Sportback, in my opinion, is found at the rear wheel arches and C-pillar. It’s here that the wide wheel arches and low profile roofline blend beautifully to portray the raciness of the brand new Audi e-tron Sportback. The car sits on big 23-inch alloys that have been 3D sculptured for that great visual impact. If you could grow wings and fly, or, more simply, climb to the second floor and look down on the new e-tron, then you’ll see that the Sportback has a full glass roof packing loads of style. Excitingly, Audi want to keep the price of the new e-tron competitive, so this bodes well for those of you who are set on buying the new e-tron SUV. Ready to hurl some decent horsepower down on the road, the e-tron SUV will be powered by 3 electric motors. After all, Audi need to keep in touch with the Porsche Cayenne Hybrid models! Two of these electric motors drive the rear wheels, while the third electric motor powers the front wheels. What lies in wait is 370 kW and AWD. That sort of stuff allows a 0-100 km/h sprint time of 4.5 seconds to become a reality. Loaded with technology for speed and efficiency, the new Audi e-tron also has an impressive range of at least 311 miles or 500 km. This sort of driving range definitely puts it in the user-friendly territory, putting it up there with the best electric vehicles in the business. Jaguar’s new I-Pace will have a similar driving range – just saying! As with some other electric vehicles, all three motors on the new Audi e-tron Sportback are designed to recover energy under braking. The amount of energy recovered can be adjusted via 4 different recovery levels. The new e-tron Sportback uses high-spec 95 kwh batteries that can be wirelessly charged at home using an AC charger or a DC fast charger. 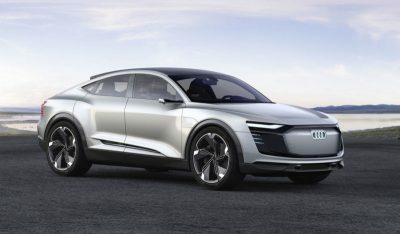 This makes life so easy, and Audi also state that by the time the new e-tron Sportback is released, owners will enjoy obtaining 150 kWh charging speeds – meaning that the e-tron Sportback can be charged to 80 % in 30 min. Wow! Inside the Audi e-tron Sportback is a digital world of virtual cockpits, powered seats and quiet progress. Audi reckon that buyers who like the look of the A7, but “want a more commanding view of the road” will like the thought of owning a new e-tron Sportback. 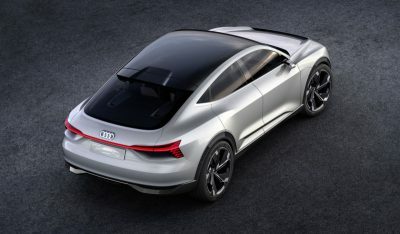 Audi’s Virtual Cockpit and Virtual Dashboard is set to feature in the new e-tron Sportback, and Audi will add touch sensitive surfaces and a larger more open wraparound design. There are two touchscreens in the centre console with haptic feedback, and the front passenger even gets their own slim digital display to tinker with. At this stage the full details of the new Audi e-tron Sportback SUV in Australia are yet to be revealed, however we will keep you posted on this exciting new model from Audi due shortly. For any more information on the new Audi e-tron Sportback SUV models or, for that matter, any other new car, contact one of our friendly consultants on 1300 303 181. If you’d like some fleet discount pricing (yes even for private buyers! ), we can submit vehicle quote requests out to our national network of Audi dealers and come back with pricing within 24 hours. Private Fleet – car buying made easy!